Posted November 25, 2014 by Cameron K McEwan & filed under Events. Having run for some time now, London is now treated to two legends of the West End amongst the cast of the musical based on the Michael Caine/Steve Martin 1988 film, Dirty Rotten Scoundrels. Following the plot of the film quite closely, Dirty Rotten Scoundrels: The Musical sees suave conman Lawrence Jameson, played here by seasoned actor Robert Lindsay (My Family), teach vulgar American Freddy Benson, portrayed by Canadian theatre actor Alex Gaumond (Matilda: The Musical), in the ways of the confidence trickster. The action takes place in Beaumont-sur-Mer on the French Riveria where the two battle for the affections, not to mention money, of “American Soap Queen”, Christine Colgate. Lindsay continues to shine in the role and oozes a knowing relish in the role. Previously he was very much the shining star of the production, but now he has some serious competition in the form of his new co-stars. Step up ‘80s sensations Bonnie Langford (Doctor Who) and Gary Wilmot, who play ageing easy target Muriel Eubanks and Jameson’s buddy Inspector Andre Thibault respectively. Langford and Wilmot are every much the equal of their lead star Lindsay and it’s heartening, and rewarding, to see their parts have been expanded in the second act to accommodate their talents. It’s really a privilege to witness such well-honed skills on stage together, and they look like they’re having a blast. Much of this comes from the fact that the audience are very much included in the show; the fourth wall isn’t so much as broken, as destroyed, danced upon and sang about. But the impressive talent doesn’t end there. The less familiar names of Lizzy Connolly and Alex Gaumond are as every bit entertaining as their more well-known co-stars. The latter has already won praise in shows like Matilda, and his Freddy Benson, whilst perhaps not as immediately engaging as his predecessor Rufus Hound, is a riot and tackles the songs expertly. Connolly, as reported here before, is very much a golden find in Dirty Rotten Scoundrels. Playing Jolene Oaks, Oklahoma born with her sights on marrying Jameson, she only gets one song but, my goodness, what a song. The actress steals the show within just a few minutes with her vivacious performance; the future has great things in store for Lizzy Connolly. The songs themselves make for an interesting mix of predictable West End glitz with a very knowing wink and twist. ‘Give Them What They Want’ and ‘Great Big Stuff’ give the actors a fun palate to dive off while more melodic pieces such as ‘What Was a Woman to Do’ afford a more technical performance. Again, the songs are as playful as the performances, each with its own dirty rotten twist. 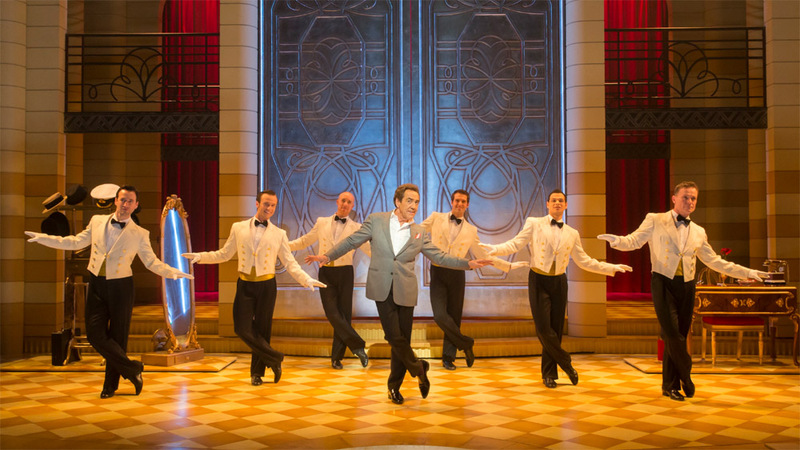 With its revamped cast, Dirty Rotten Scoundrels: The Musical has improved hugely on what was already a tremendously entertaining night out. With the supreme talent on show, you simply won’t want it to end. Performed on Wednesday 19 November 2014 at the Savoy Theatre in London. > Buy tickets on the official website.